You would never wear the same outfit every day of the week, so why should your phone? Introducing OtterBox newest case series, MySymmetry, which lets you switch the style of your case depending on your current mood, without compromising that all important protection. MySymmetry is a case that represents you, and protects your smartphone from harm – aka your most treasured possession! Made with the best protection you could ask for, its adaptable look means your personal style needn’t come second. The easy-to-install one piece swappable design inserts mean your phone can switch from office appropriate, to party-hearty, as soon as you’re ready to walk out of the door. 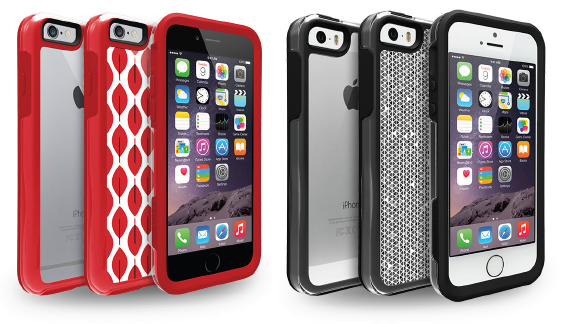 Available now for the Apple iPhone 5S/5C/6, Samsung Galaxy S5/S6, the case has all of the protection you can expect from OtterBox. Specially designed to be as slim and lightweight as possible, the new series also has all of the protective features you need for life on the go. MySymmetry initially comes in a spectrum of colors including fierce red, blue and pink; with grey and black coming soon.